1. Rinse all vegetables and let dry, especially the parsley and mint. 2. Cut stems off parsley then chop finely. Spread chopped parsley on paper towels and let rest for a few mins in order to get rid of the moisture. Parsley needs to be dry of moisture before adding it to the mixing bowl. 3. Cut stems off mint, and finely chop the leaves. Lay them on a paper towel and let dry. 4. Chop tomatoes into small cubes of less than 1/2 in then place in strainer to rid them of the juice. 5. Finely chop onions and mix with 7-spices. 6. Finely chop the cucumber. Once mixed, Tabbouleh gets soggy rather quickly, so it’s best if you mix it immediately before serving. Moreover, make sure that when you add the chopped veggies to the mixing bowl, that they are dry of moisture and juice otherwise your salad turns soggy. Ideally you want the juice in the salad to be mostly from the lemon juice and olive oil. Use only freshly-squeezed lemon juice. So if you want to prepare the ingredients in advance, do the chopping, then dry with strainer/paper towels, then place ingredients side by side in a bowl or deep tray (as in the photo above), and put in the fridge. Once ready to serve, add the lemon juice on top of the dry Burghul, add the olive oil and salt all over the ingredients and then mix lightly with a fork and avoid over-mixing so it doesn’t turn soggy. 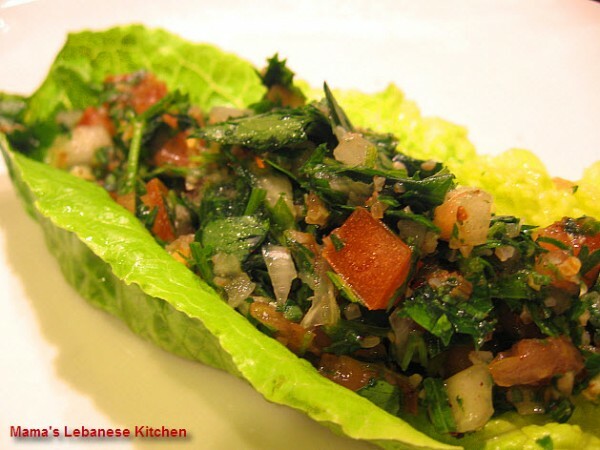 Having the Tabbouleh served on a lettuce or cabbage leaf is a cool tradition. Tabbouleh goes well with French Fries. We hope you enjoyed our recipe, and we’d love to hear your comments on it below.